Unique Gifts for Boys that they will be sure to love! Get some unique gift ideas for the little man in your life. We have searched deep and wide to find gifts that we are sure not too many little boys have. It’s that originality that makes these gifts so special. We hope you enjoy poking around on this page to find the best gifts for boys! These awesome gifts for boys are all one-of-a-kind. Be sure to see other cool gifts for boys here! We even have taken the time to find the very best gag toys, gifts for boys of all ages that will always be funny. This great learning kit makes learning fun! The Osmo Genius kit works with your iPad to create an interactive learning space for children to improve on math skills, make art projects, do puzzles, and practice spelling. It is targeting for children from 5-12 but could be gifted to a younger child to give them a head start on kindergarten. Children must work to complete levels before they get to the next task so it requires mastery of skill and has different levels to find the right difficulty for your child. It has won many awards and the proof is in the pudding, children do better in school with this fun and interactive game, bringing an educational side to iPad play. Have your child build their toys one by one with the littleBits Gizmos & Gadgets kit. Your child will be able to build 16 projects with this kid ranging from a remote control car, to pinball arcade, to a bubble-blowing bot! It pairs with any Apple or Android phone to animate these projects and bring them to life! These STEM project takes kids away from their screens doing mindless things and makes them their own engineers. This may be the most unique gift for a LEGO builder in your life because it takes the building aspect of model toys and the engineering aspect of a drone type toy and brings them together in a toy perfect for ages 8 & up. The Air Burst Rocket and Launcher works with a traditional bicycle pump to provide a safe but extraordinary launch for these foam rockets. Unlike traditional rockets that require flames, fire, or battery power, this rocket only uses the force from the bicycle pump and its own boosters to achieve insane heights up to 1,000 ft.! For an air powered rocket, it is insanely cool and powerful and one of the best rockets on the market for young kids. This rocket is amazing for kids over 10 who love rockets, but cannot build their own and launch fueled rockets yet. The height on these rockets is remarkable because of the “boosters” in the pack, and it is a terrific gift for the birthday boy in your life! The nostalgic return of Teddy Ruxpin is here and he is better than ever! With LCD eyes that express emotion and Bluetooth compatibility to connect to the app, Teddy is the ultimate storytime bear that includes pre-loaded stories and sing-along songs that he tells at the touch of his paw or vest. Younger kids will love this fuzzy companion to talk to them and sing with them all day! This classic toy has been updated to show emotion, great for kids learning cues, and it is as interactive as ever, perfect for young learners. Is he really creative? Does he like building things? 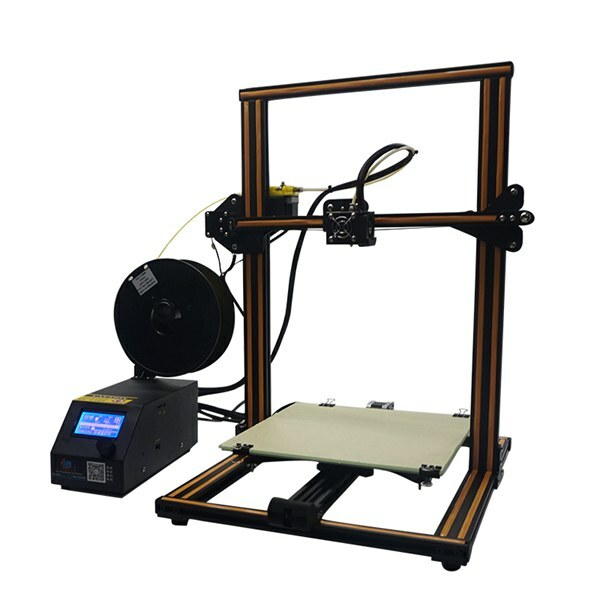 A 3D Printer is the perfect gift for him! This unique gift for boys can be used to make all sorts of things, may it be a simple cup or their own fidget spinner! The possibilities are endless with these unique 3D Printer gifts. The possibilities are endless with this unique gift for boys! If they love to rough house, they will love bumping around the backyard in these inflatable balls. They can play a fun game of soccer, or make their own unique games while wearing these blow up bumper balls! Perfect for kids who love Jenga this takes the game to the next level! With huge, bright blocks this game starts at 2.5 feet tall and can grow to be up to 5 ft. by the end of the game, perfect for big kids and big kids at heart. The game comes with a storage bag and extra blocks for height, important for keeping all the parts in place, and a color-coded die which you can use to dictate which color block needs to be removed next! It’s a really fun, larger than life spin on a traditional game. What a unique gift for a boy that loves classic games! We love the size, colors, and added extras in this fun game for the whole family! It’s a speaker. You can connect the spinner with your mobile phone bluetooth. It’s Increasing focus & concentration and also effective for deep thought. Great For Anxiety, Focusing, ADHD, Autism, Quitting Bad Habits, Staying Awake. A good choice for killing time, helps relieve stress. Perfect size suitable for Adults and kids. Easy to carry, small, simple, discrete and fun. Mini size enough to put in your pocket, have fun anytime. Perfect fidget toy to keep your hands busy or to just play with. It feels nice in the hands and it is silent so you won’t be bothering anybody. This is a major upgrade from the oringial fidget spinner! Kids are carrying around 3 at a time at schools across the nation, so why not get this unique upgraded version as a gift for your little boy? He will love playing his own music as he spins it in his hands. He will be the coolest kid in school! Launch into battle like Iron Man! With the Slide Blast Armor, kids can push a button to send armor up their arm and ?armor up? just like Iron Man! Pull the lever on the gauntlet, then push the button a second time to fire NERF darts! With the Iron Man Slide Blast Armor, kids can imagine joining the battle to save humanity alongside one of the most technologically advanced Super Heroes in the Marvel Universe! Includes 1 gauntlet and 2 darts. · Imagine joining the battle to save humanity as Iron Man · Reveal pop-up launcher by pushing button · Push button a second time to fire darts · Movie-inspired design · Ages 5 and up · CAUTION: Do not aim at eyes or face · TO AVOID INJURY: Use only darts designed for this product. Do not modify blaster or darts. CAUTION: To Avoid Injury: Use only darts designed for this product. Do not modify darts or dart blasters. This is the most unique gift for boys out there! Instead of playing with an ordinary nerf weapon, watch them prepare for the ultimate battle with this Captain America Armor Blast by Nerf! They will not be able to thank you enough when they come out of their next basement battle the champion. Purchase the Captain America battle helmet and shield set too! From the first time you saw the flash of light and that hum, way back in 1977, in Obi-Wan Kenobi’s bungalow, you knew you wanted one. At first, you weren’t quite sure what they were, but they were powerful and wonderful. And even now, after over 30 years, you still want one. The time has come, friends, to join the ranks of the Jedi (or Sith). Time to arm yourself with one of the most beloved weapons of all time: the Star Wars Force FX Lightsaber! This unique gift for boys is completely one-of-a-kind and as realistic as it gets! Buy this awesome lightsaber, just like the one legendary Luke Skywalker used throughout his time in the Star Wars movies. It lights up and hums just like the real one! See similar lightsabers here. Kids of all ages love the oversized version of the classic ring game! Guaranteed to be a hit with family and friends at birthday parties, family reunions, community centers, after-school programs, and more. Young players build teamwork and cooperation skills while they learn to match four to win. This interactive game is great for two players and also works well with teams for epic kids-vs-grown-ups championship matches. Fade and weather resistant. Have you ever seen a game so big? We used to play this game on the table, but that won’t happen now with this unique gift for boys that want to have fun! Purchase this jumbo game for a gigantic amount of fun. 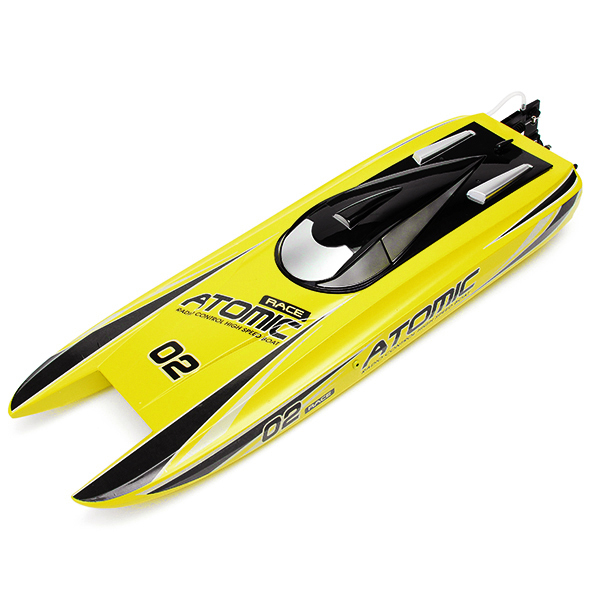 This high-speed RC boat is unlike any other! It is perfect for both beginners and advanced boys working with RC vehicles. It comes with all the equipment that it needs to run: RC Boat, Transmitter, Battery, Charger. Put it in a lake, pool, or any other large body of water and watch it go! This is so unique in the RC world. So many people have RC helilcopters and drones, but has your boy tried the RC boat? It can run on all sorts of bodies of water, and will amaze you will its incredible speed. For that future adrenaline junkie in your life, the Fisher Price theme park set is a great gift. With loops and slides, this toy can send cars down the track at great speeds and includes lights and sounds. It is more than two feet tall so towers over a lot of playsets and is an exciting toy for toddlers who love moving parts! Is there a boy in your life that is fascinated by flying cars or roller coasters? Then this toy is for them as a great addition to the Little People collection. Bring the big-lane excitement of bowling right to your tabletop! The game features a 10-pin alley measuring nearly five feet long and includes an adjustable ?hook? ball launcher, a pin rack for easy reset, and two bowling balls. Challenge your friends to see who has the highest score or try to beat your own! No batteries are required, making this game perfect for family game nights, picnics, rainy days, and more! A great gift for kids ages 5 and up. This game is so much fun to play, and doesn’t take up that much space! It can be put back in its box for storage in the closet, then pulled out and put on the table for a rainy day when no one wants to go outside. It’s just like a real game of bowling, just a little more unique. A legendary starship despite its humble origins, the Millennium Falcon has played a role in some of th erRebel Alliance’s greatest victories over the Empire. On the surface, the Millennium Falcon looks like a worn down junker. Beneath its hull, however, she packs many powerful secrets! Requires 6 AA Batteries (not included). Authentic Lights & Sounds. 4 Powerful Propellers. Ages 10 and up. What a unique gift for a boy dreaming of the day he is wisked away to the galaxy far far away! Purchase this toy to make his day; he can fly the milenium falcon around with the simple controller and its four powerful propellers. Talk about unique gifts for Star Wars-loving boys! If this one doesn’t seem cool enough, check out this awesome U-Command RC toy! These are really cool gifts for boys that love Star Wars! HoverKraft Futuristic Building and Balancing Game. Hoverkraft is an old-school building game with a twist. Players take turns stacking pieces on a platform… that levitates. Using magnetic repulsion, we’ve built a gameboard that defies gravity (take that, weak force!). Stack translucent game pieces higher and higher or remove them as the die dictates. Let boys build their own hovercrafts with this unique game gift! They will have so much fun with the magnetic magic as they try to build a hovercraft. The game literally defies gravity! We didn’t forget about your little tikes! Bath toys can be basic and rather boring but this toy makes bath time fun with its foam filled bath cones that your child fills themselves. The toy is perfect for kids 18 months and up so it’s great for younger boys who may not like taking baths or those who love water play. This toy mounts onto a wall or bathtub and the parent pours in some bubble bath. Voila! The toy is ready for kids to crank out their own foam ice cream cones to add to their bath. You can even add shampoo or other bath soaps to make kids excited about washing up! It is one of the most unique bath toys we’ve found and is great for younger kids! Also, the design is agenius, the ice cream cones are flat on the bottom so can sit on the side of the bath as your child add the pretend sprinkles to their finished products. Unleash your child’s imagination with this starter microscope set. With illumination from the top and bottom and up to 400x magnification, this microscope is great for kids to examine specimens around them or the slides included in the kit. Great for the fledgling scientist in your life! It is first and foremost a quality microscope that kids will not grow out of, but the slides it includes are fun samples that kids can get started with. 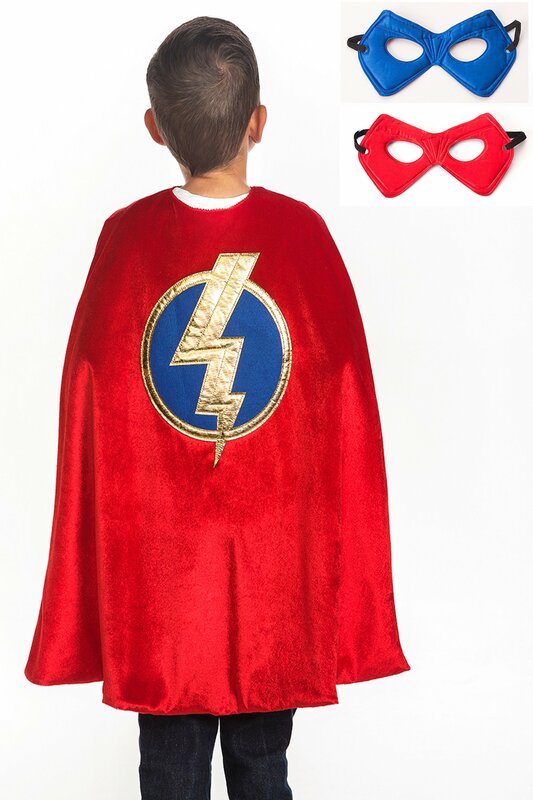 Make your child’s wildest dreams come true with this newly designed Red Hero Cape & Mask Set. The knit cape with a shiny foil lightning bolt emblem is easy for children to put on and take off with quality velcro closures. Finish the look off with the matching hero mask to hide their true identity. Mask is comfortable and secured with an elastic band. Machine washable, play friendly. Cape is 24″ from neckline to hem. We love this unique gift because no one else will have a cape like this! The little boy in your life can come up with his own superhero name as he soars around the house to save the dog from trouble and other fun imaginative games. Find other superhero costume accessories as well. The unique Virtual Reality Headset with touchpad , Seems like Samsung Gear VR; Perfect combination of image algorithm with optical scheme, reduce the distortion and dispersion; 0 – 800 degrees myopia adjustment, astigmatism and pupil self-adaption. 96 degrees FOV(same as Gear VR); 300g Lightweight, multipoint distributed pressure, makes it lighter to wear. Comfortable Headband. Detachable lycra band and multilayer foam, lightweight and durable; 360 degrees immersive game experience, with head motion tracking; IMAX 3D theater, your private theater; You may wear your own glasses with comfort. This game is exciting and incredibly unique. Boys can place their phone inside the screen and turn it on to watch shows in a 360 degree theater right in their very own living room – or rather, right in front of their face anywhere they go. This is an awesome gift for boys who always want something new and exciting to play with. Meet The Money Hungry Hound™ – your faithful protector of all your spare pocket change. 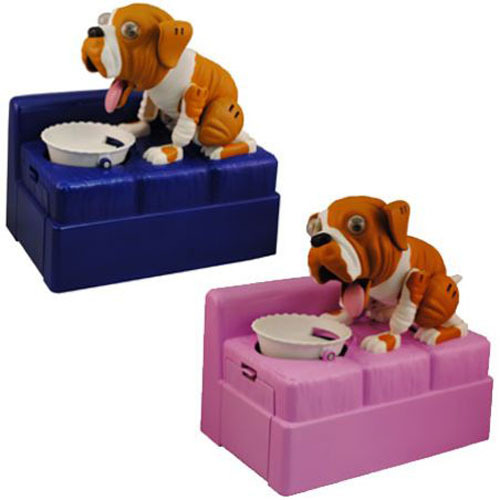 Great for all ages, just place a coin in his food dish and watch him go nuts as he licks his plate clean and obediently returns to a sitting position, ready for the next coin. The large storage area is easily accessible for that rainy day when you need your change back. Enjoy The Money Hungry Hound™ – your “coin-niverous” best friend. Teach the birthday boy to save his money with this hysterical bank! The Money Hungry Hound will take all coins placed in the dog bowl and eat them as they get transported to the bottom of the bank. This is a unique gift for a child starting to get old enough that he should learn how to save money. If this one doesn’t strike your fancy, see other recommended kid-friendly banks! These are great gifts for boys ready to begin saving money. Imagine all of the exciting moments of adventure alongside the heroic Astromech Droid and speeding into galactic battle alongside the Resistance! With the Rip N Go B-B8, it’s easy to imagine the intergalactic adventures of the expressive ball droid and loyal friend to the Resistance! Just set BB-8 down on a flat surface, pull the ripcord, and watch BB-8 take off into total Star Wars action! When BB-8 zooms into action, listen for unique droid sound effects! Rip N Go B-B8 isn’t just a droid – it’s an intergalactic hero, and it’s ready for action! Use the ripcord to send BB-8 flying into action; it even has authentic BB-8 droid sounds activated by pulling the ripcord. This is probably the most unique Star Wars gift out there; you simply pull the rip cord to activate BB-8’s funny sounds and send him flying across your floors and tables like he does in the movies. This is such a fun toy for boys obsessed with Star Wars – they will love having their own little BB-8 friend to chase around the house! Check out other cool Star Wars toys available – only the very best to add to your BB-8 collection. Featuring amazing prints, LED light front and wheels, and a built-in Bluetooth speaker, this is the coolest Hoverboard on the market. With a weight limit of 220 lbs. and speed of 8.5 mph, this is a fun hoverboard for older boys and even parents to try out! This hoverboard is not only well constructed and safe, but beautifully designed and has fun extras that any boy would love! This rechargeable 3-wheel electric scooter has 40 minutes of play time and can go up to 9mph! It is known for its 360 spins and can even drift with its hand operated braking system and push-button throttle. It can support riders up to 120 lbs. and is recommended for kids 8 and up. Because of the low center of gravity, it is nearly impossible to tip over, making it a safe and fun alternative to traditional electric scooters! Is the primary defensive and offensive piece of equipment used by the Marvel Comic’s Superhero Captain America. He is seldom seen without it. Display this model of Captain America’s Shield to show your love for this iconic Marvel Superhero. It is a 3D Metal Earth Model already assembled. Any boy that is obsessed with Captain America and other Marvel heroes will enjoy displaying this one-of-a-kind and completely unique gift on their shelf. There are no other collectibles like it!